What do you do with your toothbrush or tube of toothpaste when it needs replacing? I suspect you just throw it in the bin. You are not alone, millions do, because there is little in the way of other options. Your local council may offer kerbside recycling or have local recycling centres, but finding a way to get rid of these products is difficult, because the plastics and materials used in toothbrushes, tubes of toothpaste and other dental health products are hard to dispose of. Even Recyclenow indirectly says, you are probably going to have to throw your toothpaste tube in the bin. However, things are changing, thanks to Colgate. They have teamed up with Terracycle, an innovative recycling company that has become a global leader in recycling typically hard-to-recycle waste. 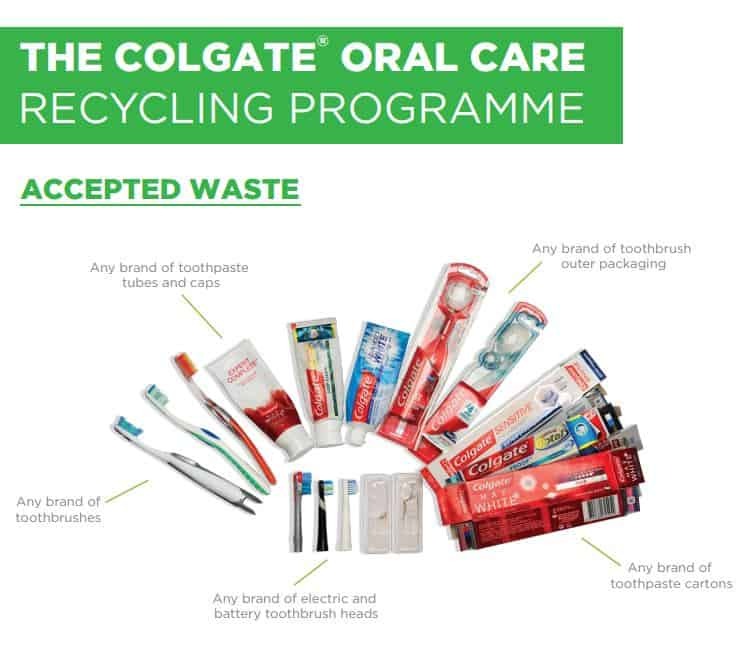 Together they have launched a completely free recycling programme for oral care products and packaging. Rather than throwing away your toothbrush and empty tube of toothpaste, you can recycle it. All you need do, is pop them into the appropriate bin at one of the many drop off locations around the country. Once full, the bin is collected and sent into TerraCycle’s facilities for processing. The recyclable products are then separated by material composition, shredded and melted into hard plastic pellets. From there they can be remoulded to make new recycled products such as benches. TerraCycle rewards shipments of over 200g, approximately 15 pieces of oral care, with points which can equal a donation to the school, charity or nonprofit of the sender’s choice. A shipment over 1kg will be rewarded 100 points, the equivalent of £1. Anyone can sign up to the programme as a private collector or a public location which will be visible on the TerraCycle map. In order to recycle this waste stream properly, please make sure all excess product has been removed (i.e. leftover product) and place all the accepted packaging in a box. If you choose to rinse your product, please note that it must be completely dry prior to placing in a recycling bin. Where can I drop them off? Click here to be taken through to a map, where you can find the nearest location to yourself to recycle your oral care products. An estimated 850 million – 1 billion toothbrushes are put into landfill each year in the USA alone. 30 million toothbrushes are used and disposed of within Australia each year. The following video promotes a more sustainable toothbrush, but it tells the story of the impact our oral care products are having on the world today.